Thanks to an invitation from Loughborough History and Heritage Network, we were invited to talk about the Your Sculpture project at their community event ‘The Future of the Past’ at Loughborough University on 21 June. Amongst talks on local archaeology and history and stands by heritage groups highlighting their projects, Katey Goodwin (PCF) and Alison Yarrington (Professor of Art History, Loughborough University) introduced the plans for the sculpture project to an enthusiastic audience. After the talk, one lady told us that she had never really paid much attention to public sculpture and took it for granted, but having heard about our project she had been inspired to look at the sculpture around her in a new way and would pay more attention in future. It was good to inspire at least one person! 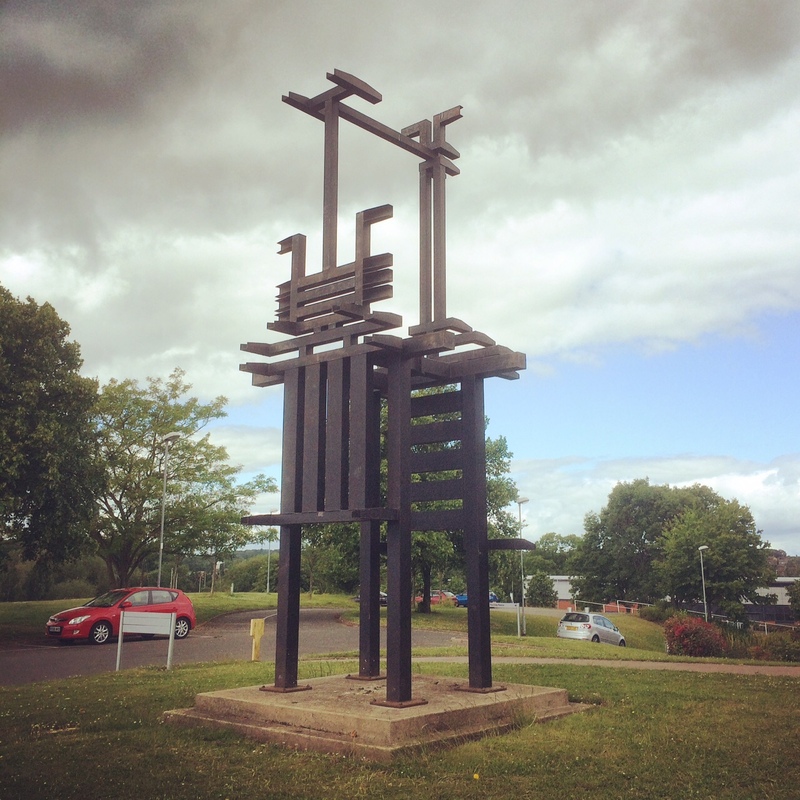 Loughborough University is home to a collection of sculptures sited across its huge campus and has its own sculpture trail. I spotted two striking works by the sculptor Paul Wager outside the Sir David Davis building on my way to the event. The image below shows ‘Strike’, a welded steel sculpture, created 1988-1989 and unveiled in 1995. The adjacent sculpture (below and at the top of this post), also by Paul Wager, is entitled ‘La Retraite’, created in 1986 and unveiled in 1995. 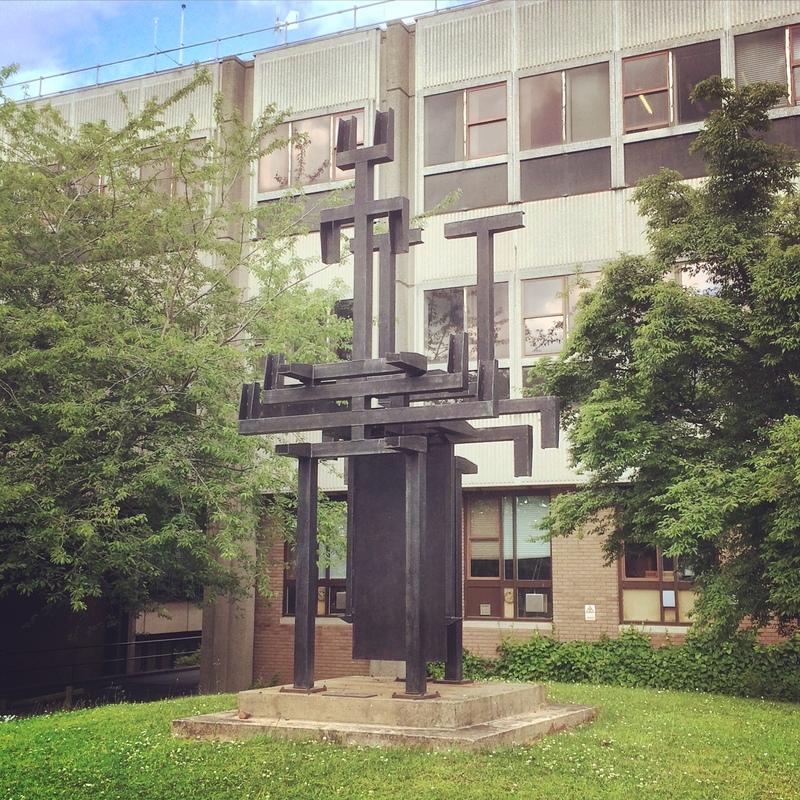 Many of the sculptures on campus can be seen on the Public Monuments and Sculpture Association website and in the published volume Public Sculpture of Leicestershire and Rutland by Terry Cavanagh and Alison Yarrington.